It is my turn to host Non-Fiction Monday today, so please simply leave your link in the comments section below and I will update throughout the day. Today I have chosen a book by David A. Adler, who is one of my favorite children’s authors and who is an extraordinarily prolific writer. No only has he written numerous Can Jansen mystery books for young readers, but he has also a number of biographies and Holocaust books. In his Holocaust books, Adler has always managed to take a frightening subject like the Holocaust and make it accessible to children without trivializing it. A Picture Book of Anne Frank is an excellent example of his ability. This biography is meant as an introduction for readers who may be too young to know much about the Holocaust and may not ever know who Anne Frank is. It covers all the important aspects of Anne’s life, from her birth in Frankfurt am Main, Germany on June 12, 1929 to her death in March 1945 in Bergen Belsen Concentration Camp. Interestingly, Adler does not make any one area of Anne’s life more importance than any other area. Often, writers will stress the diary, hiding in the attic or her personality and even her crush on Peter Van Daan, but here she is presented as a whole person, and these things, while important, are aspects of her life, no one thing is what defines Anne. I like that as an introductory biography. Accompanying the text are illustrations by Karen Ritz. A Picture Book of Anne Frank was her first picture book assignment and, she writes, the first time the Holocaust was illustrated in picture book form so teachers did not have to resort to historical photographs to teach young children about the horrors of the Holocaust. For this book, she used watercolor to portray the story, and included graphic pencil drawing to look like photos of Anne’s life, which were based on actual photographs. The mixing of Karen’s art mediums and David Adler’s text are an excellent, effective way of writing about Anne’s life in this highly recommendable book. This book is recommended for readers age 6 and up. This book was borrowed from the Wakefield Branch of the NYPL. 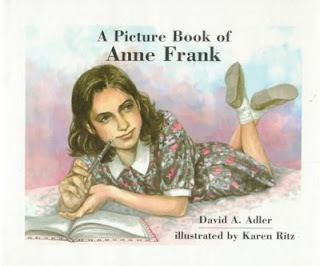 An activity guide for A Picture Book of Anne Frank is available here. And be sure to visit David Adler's website for more information about his many books, as well a Karen Ritz's website to see more of her outstanding artwork. Heidi at Geo Librarian is highlighting All the Water in the World at http://geolibrarian.blogspot.com/2012/02/nonfiction-monday-all-water-in-world-by.html. Thanks for hosting! I've got a a review of Raggin' Jazzin' Rockin' up on BiblioLinks and an interview with author Susan Van Hecke. http://theswimmerwriter.blogspot.com. Author Laura Purdie Salas has a teacher's guide which you can access from my post. Thanks for hosting! Today at Anatomy of Nonfiction you can read an interview with Laura Purdie Salas. The author of A LEAF CAN BE, Salas talks about her process, and poetry in nonfiction. Thank you for hosting. Please add my selection to the list. Thanks for hosting! This week I have an interview with Cynthia Levinson, author of WE'VE GOT A JOB: THE 1964 BIRMINGHAM CHILDREN'S MARCH. Thanks for hosting today. Geo Librarian highlights All the water in the world by George Ella Lyon at http://geolibrarian.blogspot.com/2012/02/nonfiction-monday-all-water-in-world-by.html. At Apples with Many Seeds I'm looking at 13 Art Inventions Children Should Know by Florian Heine. Thank you for hosting! Anne Frank is one of my heroes, and I will look for this book at my library. I have a bunch of his books on my TBR list, and I really need to start getting them; I thought he presented the topic in an interesting and lucid way.